This month, Pastor Bill is challenging us to awaken to what God is already doing, because God is always at work. What happens when we wake up? We open our eyes, right? All this month I’ve been thinking about seeing things differently, and I realized that in my life, I’ve reacted to what I see two different ways. Reaction #1: I label it. Reaction #2: I recognize it. What’s the difference? So glad you asked. I see something, I compare it with things I’ve seen or heard before, and I slap a label on it. The label becomes a handy way to summarize what the thing is so I don’t have to continue thinking about the thing itself. I can just use the label to make decisions about the thing. Example: Somebody lies to me. I slap the label “liar” on them, and from then on I don’t completely believe anything they say and I keep them at arm’s length because I don’t trust them. I see something, I look at the context of the thing (the surrounding situation), I listen and watch for what the Holy Spirit may show me about what’s going on, and I acknowledge what I see without assuming that it’s the whole picture or the way things will stay. Example: Somebody lies to me. I consider the context of the situation, try to understand the possible motivations and intentions of the person, recognize that they may not be trustworthy, and as I continue to interact with them I seek to understand more about how God is working in their life and what part, if any, he may want me to play in ministering to this person through our relationship. What’s the problem with labels? Labels are very useful in business. Put some papers in a folder, label the folder, and you know what’s inside. It makes things easier to find, easier to sort, easier to handle. But the problem with using labels on people is that people are always changing, and when a Jesus-follower is on the scene (that’s you and me) there is potential for great change. Recognition, on the other hand, is always in the moment. Recognition says, “I see” not “I judge.” Recognition takes in more of the whole picture and acknowledges that the person, thing, or situation we’re seeing is momentary, and this is just a snapshot in a long string of snapshots and next time we will need to _look again_ and recognize any changes that have taken place since the last time we looked. There are plenty of examples where God declares judgment on people—that is his right, as the all-knowing Creator and Judge of us all. 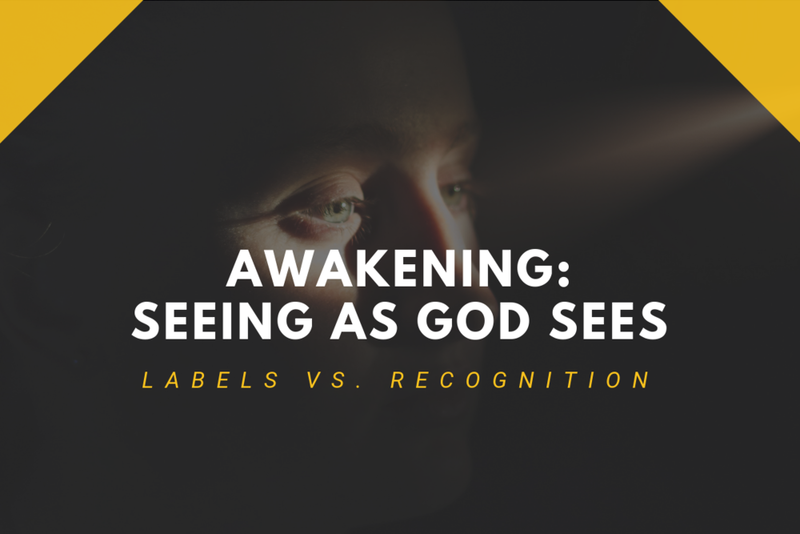 But even in divine judgment, God was not labeling: he was recognizing where someone was at and showing them where it was leading in the hopes that they would repent and change. Remember Jonah and Nineveh? God sent the message that judgment was coming, but Nineveh repented and the doom was canceled. Since God has called Jesus followers to declare the good news of salvation and make disciples (not to declare judgment on people), I usually focus on the biblical examples that show God clearly overlooking peoples’ faults and working with them despite their sins. Gideon was living in such fear that it kept him from believing God’s angelic messenger. Yet God called him a “valiant warrior” and worked with him to overcome the fear and rescue God’s people from their enemies. King David acted on his physical lust and later his shame and guilt, and not only had an affair with someone else’s wife but then killed the husband to cover up the sin. Yet he repented when confronted by the prophet Nathan and God called David “a man after My own heart”. It’s not that God is blind, or tolerating sin. God is calling forth something that doesn’t exist yet. With his words, he is planting new seeds and watering seeds he planted earlier. He has faith in what he designed and intended, even though it hasn’t yet fully formed in that person. And his faith is helping it to come to pass. What if our faith in God’s intended plans could also help bring them to pass? What if we believed with complete confidence that God was working for positive change in even the most difficult people we encounter? What if we could recognize the seeds that needed to be watered, or an opening to plant new seeds in someone’s heart? Just imagine what kind of difference our faith will make, as we learn to recognize the people in our lives as God’s precious creations who are called to become His children, instead of labeling them by what they’re doing now or have done in the past. NEXT STEPS: Ask God to show you someone whom you have labeled in the past. Once they come to mind, ask God to show you what He sees, what He desires for their life. Pray in agreement with what He shows you, and consider ways your next interaction with that person can encourage and affirm something good God is doing in them.